First son of the great Archon Marlowe, his family rich from uranium mining and powerful as all noble rulers are, Hadrian Marlowe is neither as coldly efficient or as traditionally dedicated to his society’s expectations as his father. Until now, he had not really grasped how much of a disappointment he is in his father’s eyes. Only one son can rule after Lord Marlowe, and Hadrian’s younger brother seems determined to have the position for himself. The question is, does Hadrian mind if he does not inherit? And if he does not, is it for the right reasons? He who began life as that first son, has worn many other names during his long years. He has killed, and nearly been killed. He has destroyed, and nearly been destroyed. He has loved and lost, and watched others love and lose. He has had his morals tested and his beliefs pulled from under him. He has travelled, suffered, borne heartache and privation, risen and fallen again, and he lives yet. 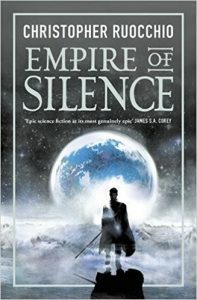 With a truly captivating opening giving the sense of a grand, old saga of the ages, Empire of Silence is full of promise from the start. The story of Hadrian’s adventures is told entirely from his point of view as he relates his fall from grace and the tragic steps his survival takes from that point on. To classify this story we are certainly in the vicinity of a Space Opera, firmly in a science fiction universe, but historical settings and themes along with an epic fantasy feel to the main character produce something a little different to the norm. This weighty tome does take some slight labour to begin with but once the reader becomes used to the narrative style and jumps in time, Hadrian becomes an endearing protagonist. 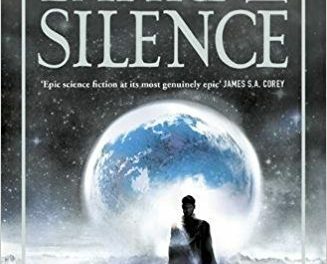 His compassion and ability to understand others adds greatly to the reader’s feelings towards him, and the episodic chapters make the story easier to digest as it moves forward. Just as Hadrian takes the reader through his long life and his adventures, the story is deep with the pains and burdens such a long life carries. To say Hadrian’s trials come to a satisfying end via a satisfying journey would belittle his experiences and the investment in relating and reading his tale. Rather the ending is precisely the way it needs to be when considering all that has come before. With an opening that promised a saga of ages, by the ending Ruocchio has certainly delivered something touching and unique.